No sophomore slump here! 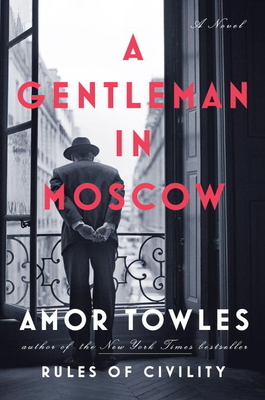 After his wonderful debut novel, Rules of Civility, Amor Towles graces us with the story of Count Alexander Ilyich Rostov. This “Former Person” has been sentenced to house arrest in the world famous Hotel Metropol of downtown Moscow. This is a charming mashup of Eloise; Upstairs, Downstairs; and Anna Karenina (the juicy bits, not the dry agrarian policy parts); with a bit of Shawshank Redemption tossed in for a delightful twistiness. The Count continues his pursuit of a life examined after he is down-sized from a well-appointed suite to a tiny room on the top floor. He befriends everyone who matters – including a feisty nine-year-old, the bartender, the chef, and the maître d’ – and spends the next thirty years observing the hotel and Russia evolve. There is political intrigue and romantic entanglement, domestic interplay with global implications. This is as satisfying as dinner at a fine restaurant, paired with the perfect wine, enjoyed with the perfect companion, served with impeccable panache – all to be found at the Hotel Metropol.